Budget and staff constraints faced by government agencies can greatly hinder their ability to provide fast resolutions to users. Support teams that don’t tap into email ticketing when building their knowledge base are missing one of the richest sources of information. Lack of a centralized ticket management system in educational institutions can lead to slower response times, ticket errors, missed tickets, and unhappy end-users. Protect the integrity of agency and end-user data with security best practices. Keep IT asset details in one place with integrated asset discovery, management, and tracking. 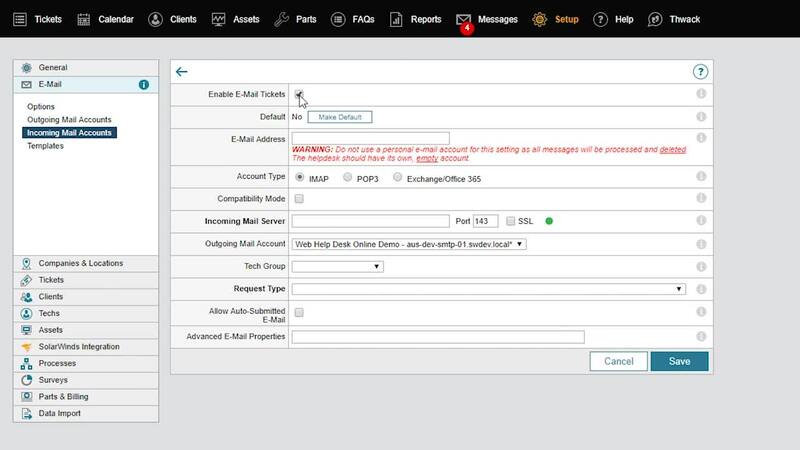 An automated support solution with ticket alerts results in cost savings and happy customers. Robust performance reporting tools help pinpoint recurring issues and where extra help is needed. Protecting end-user and organization data is a critical component of help desk software. Avoiding security breaches on the support level requires the right mix of people, processes, and technology controls. With Common Access Card (CAC) capabilities, mandatory two-factor authentication, and Active Directory integration, Web Help Desk® software is designed to keep information and interactions between government agencies and their end-users secure, protected, and safe. In addition, enhance security by enabling FIPS-mode SSL connections for protocols that include HTTP, Microsoft Exchange, IMAP, POP3, SMTP, WMI asset discovery, LDAP, and the SolarWinds® Orion® Platform, and meet certain regulatory compliance requirements with FIPS 140-2 compatible cryptography. Managing and tracking IT related assets presents endless challenges for IT support teams. Without integrated help desk asset tracking, government agencies face compounded difficulties when providing support. Tracking down missing details on parts, billings, recalls, and system updates, or scheduling replacements can present a massive time and resource burden on support staff that is already stretched thin. Automated asset discovery and the ability to bulk import assets makes it easy to keep IT inventory up to date, conduct faster auditing, and provide error-free help desk reporting. Learn more about Web Help Desk software’s ITAM capabilities. Without workflow-driven automation and prioritization, support agents spend more time managing and tracking tickets than fixing problems. 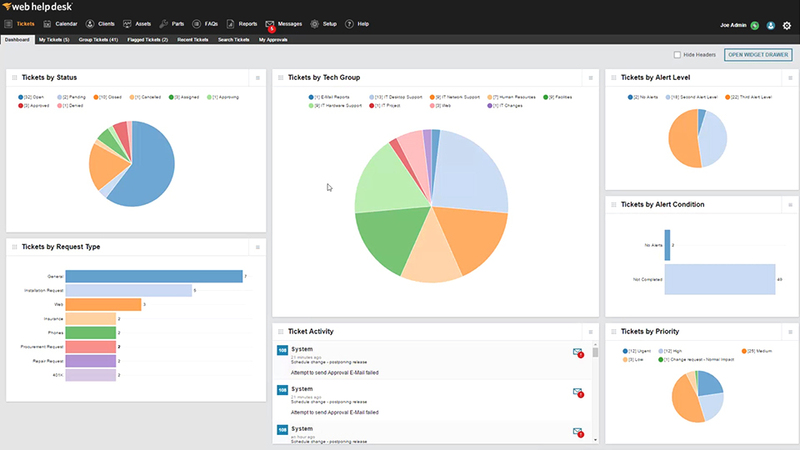 A fully integrated and automated ticketing and alert system allows IT teams to centralize all tickets from request to resolution. Automating manual and repetitive tasks, streamlining service workflows, and automatic assignment, routing, and escalation to the right agent at the right time improves response times and helps increase end-user satisfaction. Responding to recurring support requests takes up valuable time that could be spent working on new or more complicated issues. Leveraging the built-in, searchable, and easy-to-use knowledge base enables IT support staff to create and maintain FAQ articles directly from a ticket and make them available to end-users. This resource helps limit the number of inbound service requests, frees the IT support agent from ticket overhead management, and allows users to quickly find the answers to the most common issues when they need them. Discover the benefits of knowledge base management. Without a centralized dashboard, it is hard to quickly evaluate support team performance, productivity, and workload. Manually generating reports can take time managers may not have. Being able to see trends as they are developing, or over time, can assist teams in deploying resources and identifying systemic problems and issues. A centralized dashboard showing data related to technician performance, customer support needs by location, real-time billing metrics, and incidence frequency can confidently pinpoint bottlenecks and where improvements are needed. "20 technicians are using the system, and we have process rules set up that will automatically assign tickets in some instances… It serves our end goal of a pain-free customer interface."